KINGSTON, Apr 30 2012 (IPS) - A growing appetite for oil and some of the Caribbean region’s highest electricity rates and petroleum prices are driving Jamaica’s thrust toward clean energy alternatives. This country of 2.7 million people now spends more than it earns on imported oil. Between January and June 2011, Jamaica spent 1.48 billion dollars on oil imports, while export earnings for January to September 2011 were 1.3 billion. In the words of environmentalists, the situation is increasing the nation’s vulnerability to external shocks and putting pressure on the local environment. 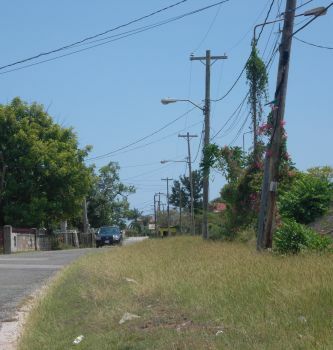 Most of the island’s electrical installations lie inside the 10-metre vulnerability zone that experts say will be impacted by sea level rise due to climate change. The increasing demand for electricity is also increasing Jamaica’s greenhouse gas emissions. Experts have described Jamaica’s economy as “highly energy inefficient” because 95 percent of the island’s energy needs comes from imported petroleum. Electricity generation uses 23 percent of oil imports, in part because of ageing equipment, theft and inefficiencies in the distribution system. According to the Washington-based Worldwatch Institute, the inefficiencies are the result of the high cost of energy conversion and high transmission and distribution losses. Other contributing factors include the demands of the bauxite and alumina industry. “We are not producing enough and at the present rate we will be borrowing more just to pay for oil,” said Northern Caribbean University lecturer Dr. Vincent Wright. The World Bank validated the complaints of the local business community when it identified high energy costs as one of the main hindrances to economic growth. Electricity rates have increased by 135 percent in 10 years, outpacing the annual economic growth rate of about one percent per annum over the same period. Even though more than nine in 10 Jamaican households have access to electricity, soaring rates have made the commodity too expensive for many. So in addition to high levels of theft, reports are that electricity usage has fallen because people are cutting back. Taxi driver John Thompson has opted to cut back on luxuries like the use of his washing machine. “We can’t afford to pay light bill so we turn off the fridge at nights, turn off the lights and now the wife wash mainly by hand,” he said. In a bid to increase the use of alternative energy and cut spending on oil, government changed the rules. In November 2011, the Office of Utilities Regulations (OUR) announced that individuals could generate their own electricity from alterative energy sources and sell the excess energy to the local electricity supplier. – Jamaica’s spend on oil imports is now topping its export earnings and environmentalists are worried that high electricity rates and petroleum prices are increasing the nation’s vulnerability to external shocks and putting pressure on the local environment. So far, 10 applications have been made to sell excess power, the head of communications at OUR Michael Bryce told IPS. “The Electric Lighting Act empowers the minister to issue licenses to persons wishing to supply electricity for any public or private purpose. Persons wishing to sell electricity must therefore first obtain a licence from the minister before their facility can be connected to the national grid,” he explained. Ambitious plan or “pipe dream”? Pressured by the need to cut spending and cushion the effects of spiraling oil prices, Minister of Energy, Science and Technology Phillip Paulwell in January promised to reduce electricity rates by up to 50 percent over the next four years. Technocrats have described the minister’s plan as a “pipe dream”, but Paulwell is undaunted. He is pushing ahead with plans that he hopes will slash oil imports by 60 percent. He also hopes to boost the contribution of alternative fuels to electricity generation from the 20 percent committed to in the country’s 2009 energy policy to 30 percent by 2030. Wright is among those who see the minister’s vision as “extremely difficult” to realise. More than three million energy-saving light bulbs have been distributed to an estimated 600,000 homes across the island since 2007. Plans are also afoot to replace the 90,000 sodium vapour street lamps and to increase energy efficiency in government offices and institutions. The National Housing Trust - a compulsory scheme that provides cheap financing for potential homeowners - now offers solar water heater loans to contributors. Statistical Institute's 2001 estimates indicate that there are 748,000 households. And in February, government signed a new research partnership agreement to develop biofuels from Jamaican oil- seed bearing plants. “It is going to take a lot of public education, investment in research and the political will (just) to achieve the 20 percent. There must also be investments in technology to automate businesses, the public and private sectors must also become energy efficient,” said Wright, who heads the Natural and Applied Sciences College at the university. Other strategies have included a National Energy Policy, several sub- policies and programmes to guide the government’s goal of “a modern and efficient energy sector that does not harm the natural environment”. Since 2008, E10 gasoline, a blend of 10 percent sugarcane ethanol and 90 percent petroleum, has been sold at service stations island-wide. And the state-owned Wigton Wind Farm has added more than 40 megawatts of generating capacity to the grid. This represents 2.6 percent of the island’s electricity generation and is enough to serve 50,000 homes per month. “Wigton is helping the country to reduce its ecological footprint by reducing emissions,” said Nicole O’Reggio, head of pollution control in the Ministry of Environment and Climate Change. The wind farm’s 32 turbines are expected to reduce emissions by an estimated 85,000 tonnes a year, offsetting some 60,000 barrels of oil per year. In the five months between April and August 2011, Wigton shaved 2.7 million dollars from the oil bill. Jamaica uses 77,000 barrels of oil a day. The region’s first designated Clean Development project, Wigton also benefits from a carbon credit trading arrangement with the Netherlands, O’Reggio told IPS. There are already independent suppliers producing electricity at lower rates than the sole distributor the Jamaica Public Service (JPS). And faced with legal challenges to its supply monopoly from an increasingly disgruntled customer base, the company has begun diversifying its generation. Nine hydroelectricity generators and a wind farm have been added to its 840 megawatts of capacity in recent years. The company is also installing another two hydropower stations and was recently given permission to build a 360-megawatt combined-cycle to be powered by liquid natural gas. The new plant is scheduled for completion by 2014 and according to the JPS, will cut electricity costs by between 31 and 45 percent. There is consensus that Jamaica’s alternative energy potential is immense, but how to exploit it may prove challenging to a cash- strapped government. And meeting the targets could be problematic. Even as many agree that reducing the cost of energy should go a long way to boost Jamaica’s productivity, some say that Paulwell’s plan won’t work. To make it work, many experts agree that there must be a drastic reduction in the price of fuel. The government must also sell its plans to the International Monetary Fund (IMF) since the removal of duties from alternative energy devices will cost Jamaica much-needed tax revenue and the conversion of street lamps will increase government spending.